Gareth Kennedy explores a critical play with material, place, trace and legacy in Carrow Teigue and surrounds. 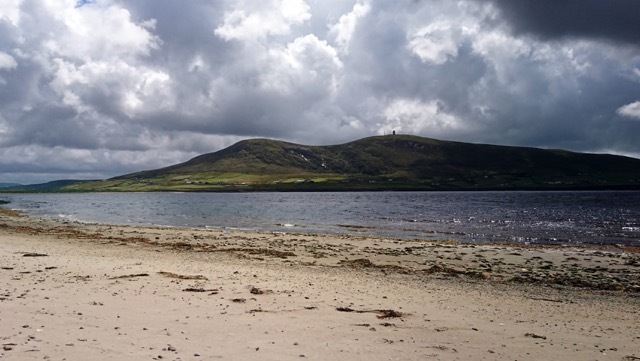 Research visits to national museums and archives holding archaeological and folkloric material relating to Erris have been supplemented with on the ground meetings with inhabitants. Additional meetings with archaeologists, folklorists, dendrochronologists, Bord Na Mona personnel and pollen analysts have lent diverse perspectives on how to decode and understand an expanded sense of time in relation to contemporary Carrow Teigue. Kennedy is interested in how to interface this museological and specialist knowledge with the rich knowledge and lived experience today's inhabitants hold embodied within themselves. Interfacing material from the museum, the collection and the archive with skill sets and material from Carrow Teigue to develop an experimental material culture, the intent is to then ceremonially bury material outcomes, thus engaging the bogs chemistry and it's uncanny ability to hold things in stasis in time. This 'time rite' will be a publicly staged and 'reverse engineered' experimental archaeological dig. It will be dually informed by specialist knowledge married to the genus loci of Erris. Depending on how best to 'measure time', the vision is to unbury and recover the material culture from the bog at a time collectively agreed upon as prescient. How can we define and agree upon such prescient moments? Bog wood forest exposed by Bord Na Mona industrial harvesting of the bog. The trees date from the so-called 'Pine Flush', a natural afforestation of North Mayo after the collapse of Neolithic farming activity in the area some 5000 years ago. The trees themselves became interred and preserved in the bog following further abrupt climate change. View across Broadhaven Bay from beach at Corrán Buí. Gareth Kennedy’s work explores the social agency of the handcrafted in the 21st century and generates ‘communities of interest’ around the production and performance of experimental material cultures. Deploying an anthropological approach these works draw on the particular social, cultural and economic histories of location. Outcomes typically include architectural or designed structures, films, hand crafted objects, printed material, as well as live performative events which bring these physical entities to life within specific public contexts. Kennedy has produced and shown work both nationally and internationally. His practice to date includes public art work, publications, educational projects, exhibitions, residencies and collaborations. With sincere thanks to the inhabitants of Carrow Teigue and Kilgalligan for their hospitality, generosity and insight throughout this residency. Also with thanks to staff (past and present) of UCD Archaeology and Folklore departments, the National Museum of Ireland, and Bord na Móna.